Make consumers aware of KING CONE’s new positioning of ‘the ultimate craving satisfier’ and position the brand as the snack of choice. A craving for something sweet can strike at any moment. 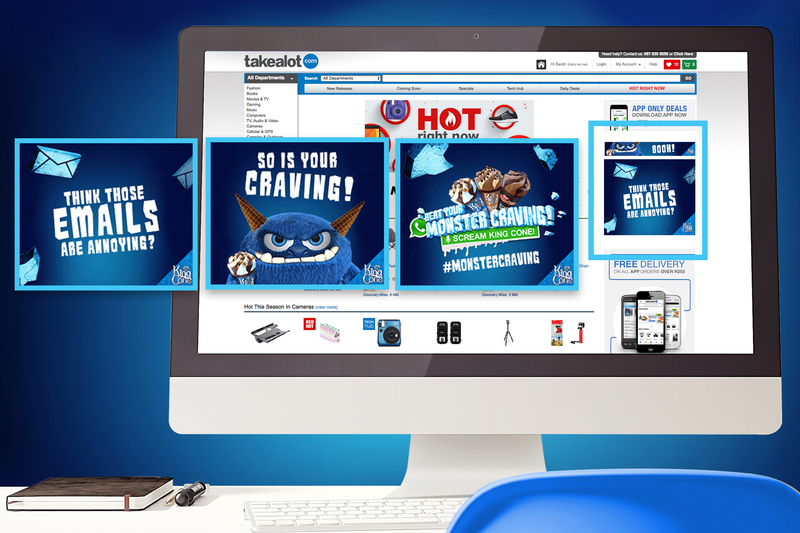 A ‘Monster Craving’ leads to snackers making impulse trips to the nearest garage to indulge their craving. “I scream, you scream, we all scream for…” we wanted people to scream, not just for ice-cream, but for KING CONE. 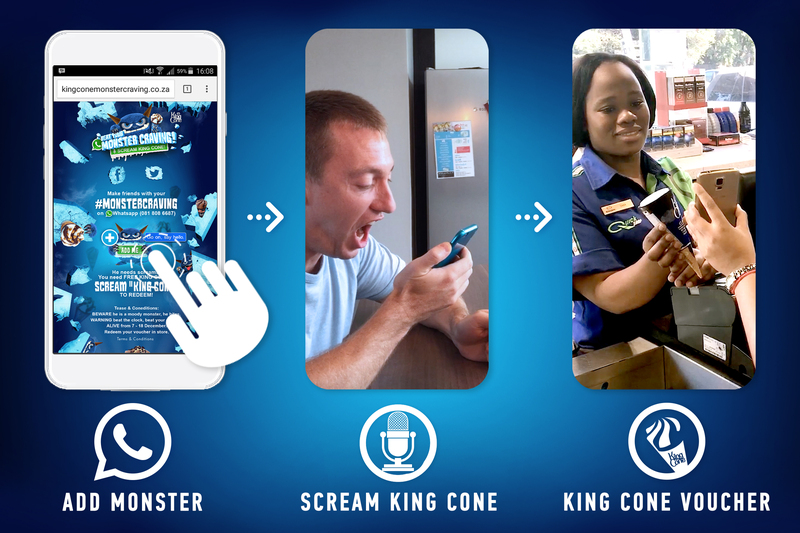 We created a virtual ‘Monster’ to give out KING CONES to those screaming for them. 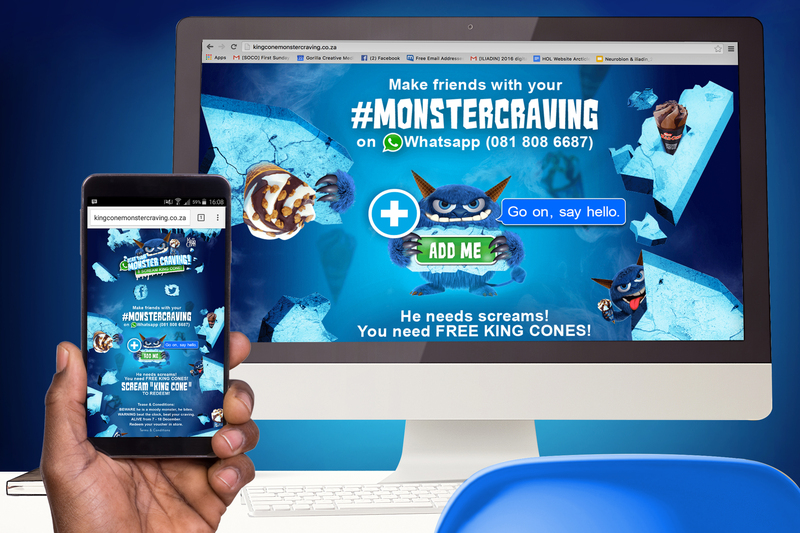 He personified the #MonsterCraving and communicated with snackers directly on WhatsApp and Facebook Messenger. 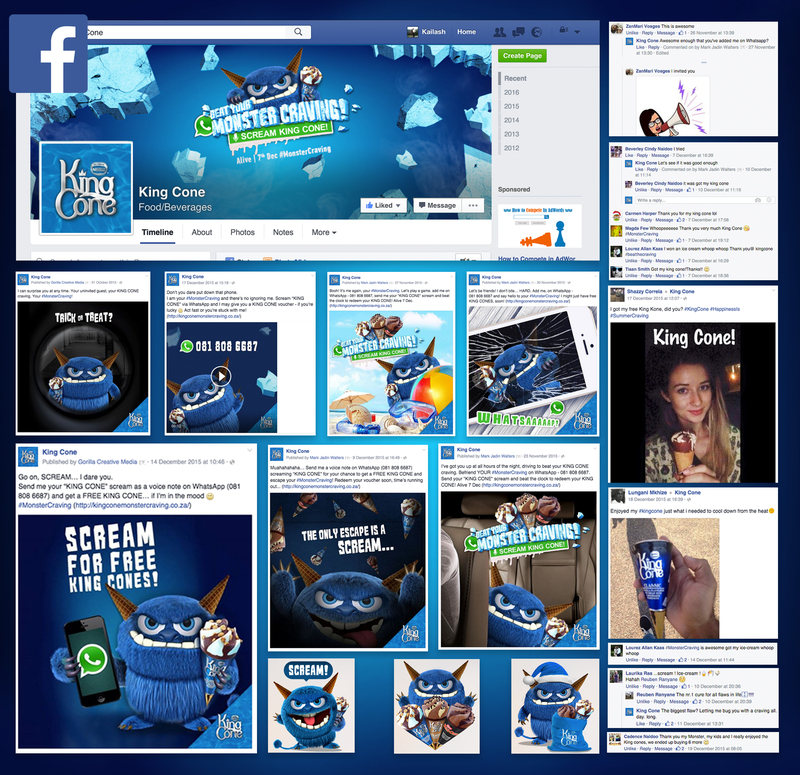 The Monster took over KING CONE’s social profiles on Facebook, Twitter and Instagram, each driving fans to add him on Whatsapp. 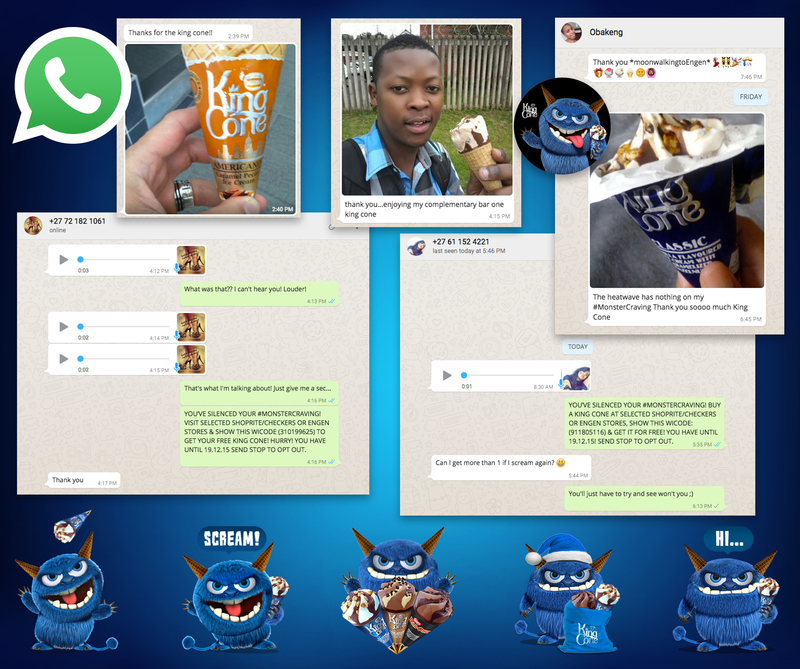 With an innovative piece of coding, thousands of fans were able to add the #MonsterCraving on Whatsapp with just one click – bypassing the inconvenience of having to manually adding a contact and removing what normally would be a clumsy process. This enabled us to chat and deliver vouchers to consumers’ mobile phones. People were literally screaming ‘KING CONE’ using Whatsapp voice notes for a chance to claim a free KING CONE. 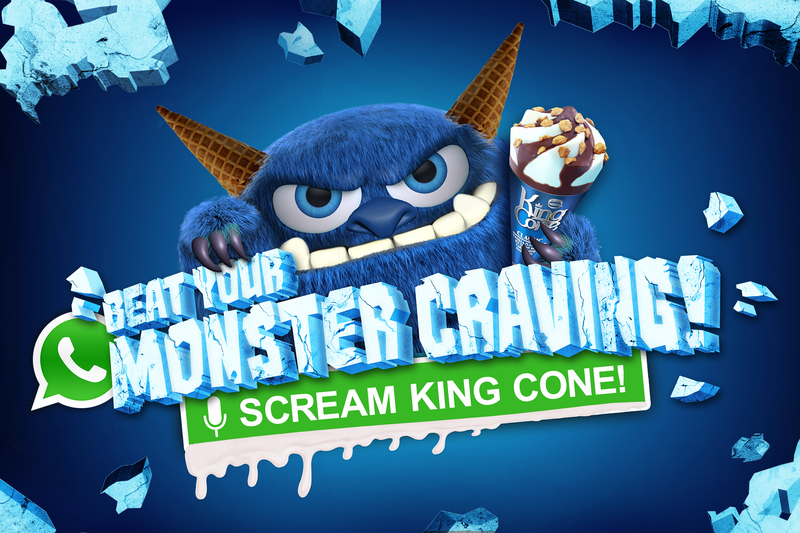 The #MonsterCraving either ignored them, reacted or gave out a free KING CONE WiCode voucher as an SMS to redeem in-store – it all depended on his mood at the time. 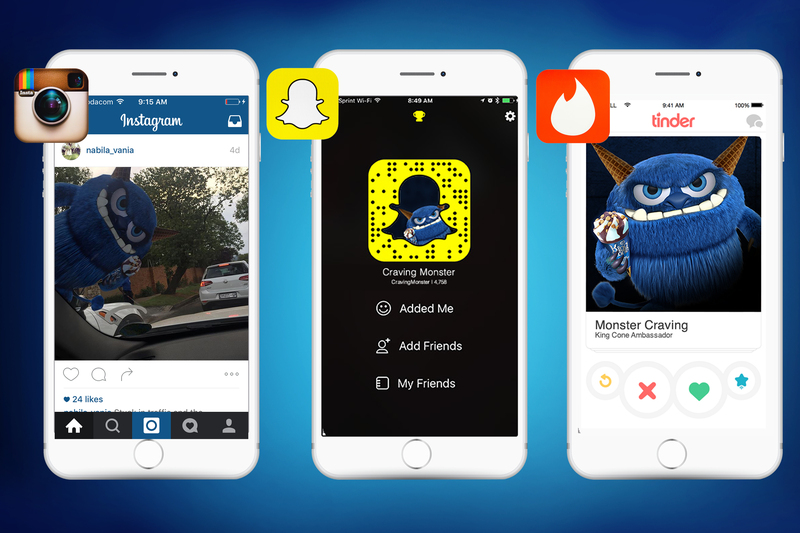 Popping up everywhere, the #MonsterCraving took to Tinder, SnapChat and GDN banners which followed users from one site to the next. Just like a craving, there was no way to escape him. 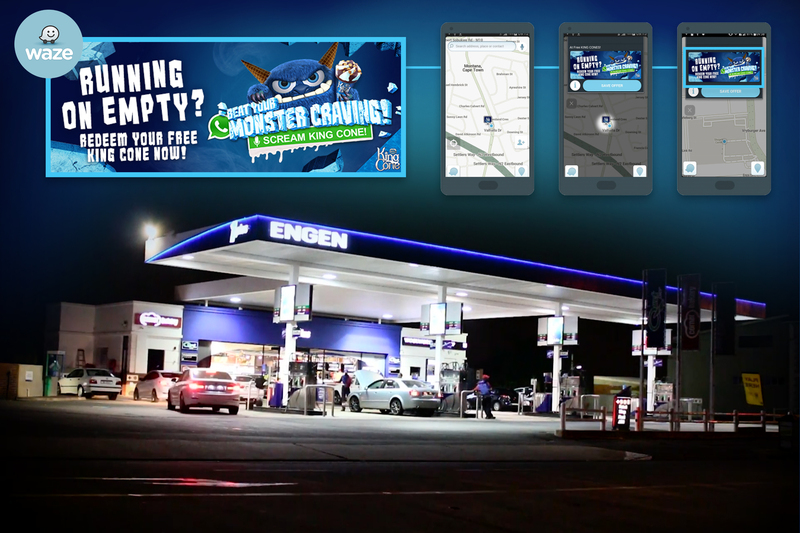 Using WAZE and proximity banners, drivers were directed to their nearest Engen, making it easier for them to beat the #MonsterCraving with free Wi-Code vouchers. Although a tiny budget, Monster Craving made such a big impression with his fan base that the brand has become synonymous with the term ‘Monster Craving’ in conversation. We reached over 2, 784, 376 people during the campaign. 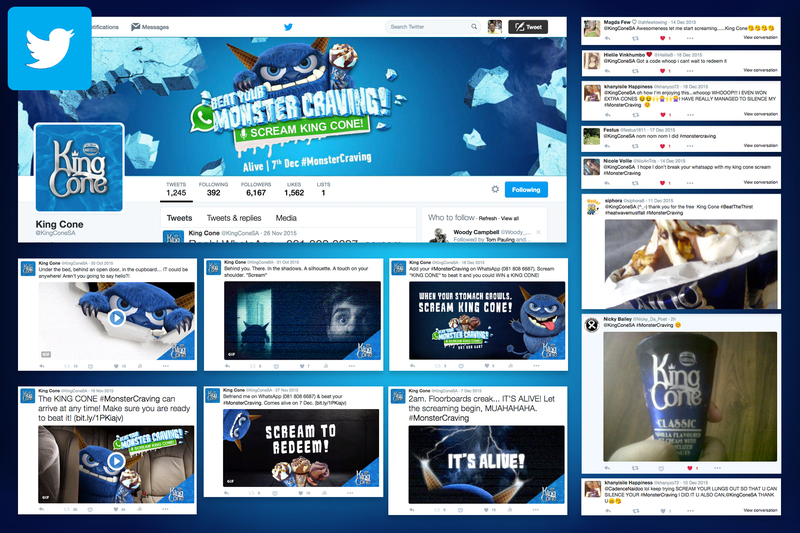 Post the campaign, consumers are still in conversation with the Monster and continue to utilise the hashtag #MonsterCraving.